The first fall CSA box was ready this week. What a wonderful fall bounty to kick off the fall farm season! It is time to continue making comfort food, switching from summer light and airy salads to more chowders and hearty pasta sauces. And my fall CSA is feeding directly into that. What is a CSA you say? Well only the best thing since sliced bread! If you aren’t involved with a CSA, now is time to get involved. A CSA is a way to support a local farm that participates in Consumer Supported Agriculture. Participating in a CSA is a fantastic way to become engaged with local farms. Supporting local organizations through attending and purchasing from local farmers markets is a wonderful connect to the community, and participating in a CSA is an extension of that support. The farm that I support with the CSA program offers either a half or whole share per season, and there is a financial commitment. You pay for your seasonal share ahead of time. The amount of produce in the share is the difference in size. Fall is very busy for my family, so this fall I opted for a half share. What does that mean? A share is a portion of local produce that the farm is seasonally harvesting. With a CSA, the member goes to the farm or designated community location once a week to pick up their share of fresh produce. The produce is fresh, local, and intended to be used within a few days. By the time the produce is used, its time to go back to the farm for another share. 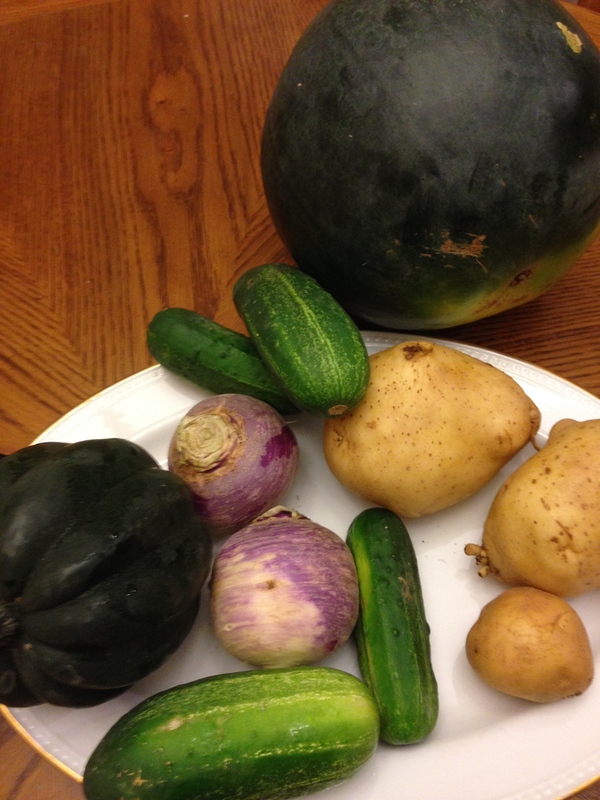 This week, my share included cucumbers, turnips, potatoes, an acorn squash, corn on the cob, and the bonus of a late season watermelon. Last night, I used the potatoes and turnips to make a potato turnip gratin. My children had not ever had turnips before, and making a warm hearty potato dish with turnips added was a great way to introduce the vegetable to them (for the record, the boys loved it, my daughter not so much…). I used the cucumbers to make some refreshing cucumber water to keep in the fridge. With the acorn squash, I simply cut it in half, scooped out the seeds and baked it in a 400 degree oven. I put a little butter, brown sugar and maple syrup in the center before baking. Easy and delicious. I served it along side a baked chicken. It is fun to be creative with the ingredients. I can’t wait to see what is in my CSA share this week. I pick my share up on the actual farm that grows and harvests the produce. Leaving my office during a busy day, driving 10-15 minutes down the road to the farm, and having a chance to talk to the farmers while getting my share is something I look forward to all week. My family is excited to see what I bring home, and we have a blast with the ingredients. Best of all, I get a chance to support local farmers and have fresh, healthy seasonal produce. If I am delayed and don’t make it to the farm one week to retrieve my share, it is donated to the local community food pantry or food bank. Look for a CSA in your community and let me know what you come up with! My CSA share this week. I am having a blast experimenting. 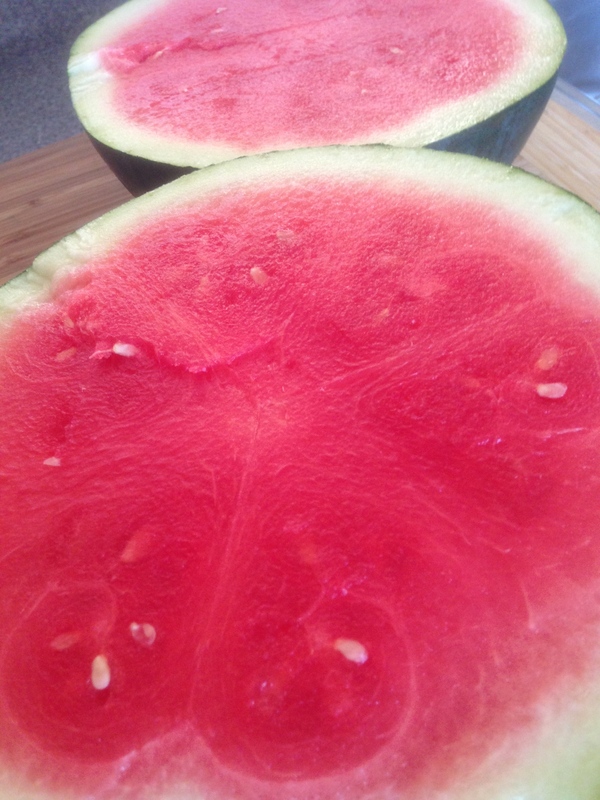 Sweet fragrant and decadent late season watermelon was a bonus this week with my CSA share. ← Soup-Rich warm comfort food! Yum!